Prototype: One (1) type B9c9x express train slumber coach, 2nd class, with the second higher roof design, and one (1) type B9c9x express train slumber coach, 2nd class, with the first lower roof design, painted and lettered for the French State Railways (Société nationale des chemins de fer français / SNCF). Use: High-quality long-distance service, here in the D262/263 Orient-Express of 1987. 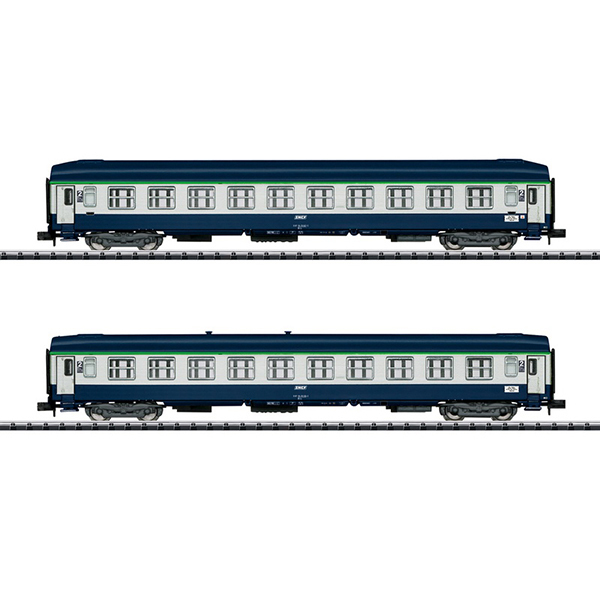 Model: These cars have tooling variations with smaller door windows and with the second roof design on the first slumber coach. The cars have close coupler mechanisms. Interior lighting can be installed in the cars. Total length over the buffers 306 mm / 12-1/16".